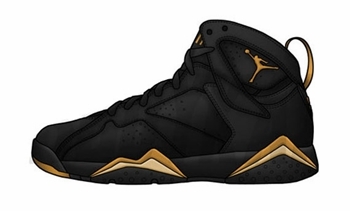 What was just a rumor that started earlier this year has been confirmed as Jordan Brand announced the official release date of the Air Jordan 7 “Gold Medal”. This gold medal and Olympic-related edition of the Air Jordan 7 will be hitting the market on August 18 after the 2012 London Olympics along with the Air Jordan 6 “Gold Medal”. According to reports, both can be purchased in a single package called the “Gold Medal Pack” for $350. More details are expected to be revealed soon. We will keep you updated!